Hello! This is slamo's page. I started doing DOS TASes in 2013 when I noticed that most of the DOS library had not been TASed, and I've been chipping away at it ever since. I have interest in plenty of console games as well and I plan on branching out to those at some point, but there's still so much to do. I also have a lot of interest in libTAS, mainly running DOS games, source ports, and other emulators within it. 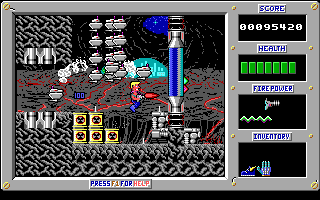 DOS Commander Keen: Keen Dreams (Shareware) in 04:15.13 by slamo. slamo improves his previous TAS by 24.98 seconds (~21.22 seconds on RTA timing), thanks to a new route, ditching two long levels (Melon Mines and Spud City) in favor of 4 shorter levels on the southern part of the overworld. DOS D/Generation (any v1.0) in 05:56.63 by slamo. 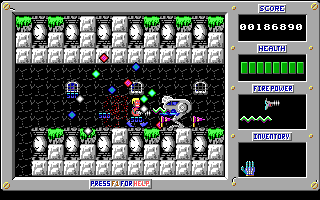 D/Generation is an arcade adventure computer game with puzzle elements, published for the PC, Amiga and Atari ST by Mindscape in 1991. In 2018 it was ported to Nintendo Switch by West Coast Software with HD graphics. The game takes place in a slightly cyberpunk futuristic setting in 2021. A French company called Genoq has developed a series of new genetically engineered bioweapons, which have run out of control and taken over Genoq's Singapore lab. The main character is a courier making an emergency delivery by jetpack of an important package to one of Genoq's top researchers, Jean-Paul Derrida (a name likely inspired by the philosophers Jean-Paul Sartre and Jacques Derrida), and who is happily oblivious to the carnage until the lab's doors lock behind him. His customer is ten floors away, all of them crawling with bioweapons. DOS Duke Nukem: Episode 2 - Mission Moonbase (unknown) in 06:56.82 by slamo. 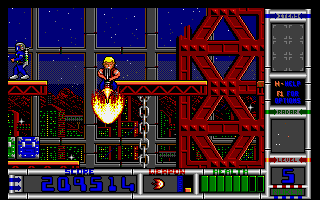 Long before Duke Nukem ever starred in a 3D game, he was the hero in two platform games. 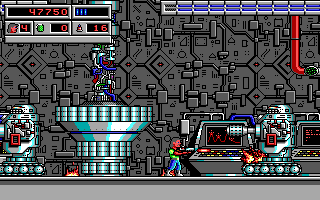 This is the first game in which he starred, battling Dr Proton to save the Earth from his evil Techbot army. This run by slamo plays through Episode 2 - Mission Moonbase in record time. DOS Duke Nukem: Episode 3 - Trapped in the Future! (unknown) in 06:48.15 by slamo. In the year 1997, the maniacal Dr. Proton has developed mechanical creatures known as Techbots. Commanding an army of Techbots, the insane scientist intends to conquer the entire world. There is only one hero on Earth who can stop him with his guns and attitude: Duke Nukem. 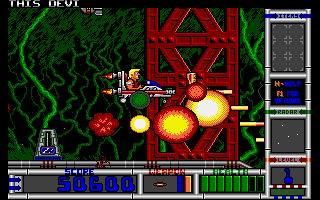 Duke Nukem: Episode 3 - Trapped in the Future is a side-scrolling shooter with platform elements. 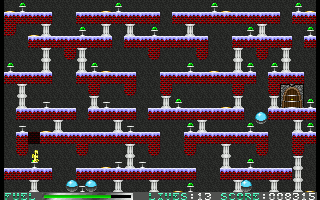 Most of the gameplay consists of shooting enemies and exploring the environments, trying to reach the exit and advance to the next stage. In this final episode, Dr. Proton has created his own future, where his power cannot be matched; Duke is thrown into this future nearly defenseless, and has to figure out a way to escape and defeat the mad doctor once and for all. DOS Duke Nukem II (Registered v1.0) "Episode 2" in 06:27.46 by slamo. This run completes Episode 2 in record time. Check out this movie for a run of the first episode. 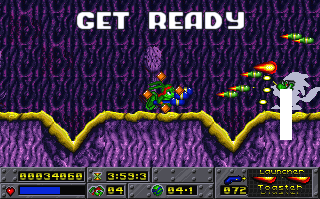 DOS Jetpack (1.5 freeware) in 32:22.56 by slamo. 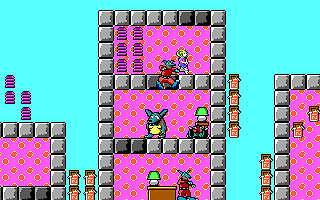 Jetpack is a platformer game (now freeware), featuring a man equipped with a jetpack which he uses for flying (if it has fuel, otherwise he can jump) and a phase shifter for temporarily getting rid of troublesome bricks. His goal is to collect all the green gems in 100 devilish stages and avoid hordes of enemies. In this extremely carefully planned run, slamo completes the game in 32 minutes and 22 seconds with large heaps of luck manipulation and glitch abuse. A normal player would barely get through the first 10 levels in that amount of time. Prepare to be blown away watching large complex levels completed in under 20 seconds on average. 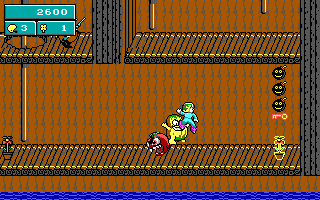 Enjoy seeing extremely tight movement with enemies all around without getting hit, or getting hit yet somehow managing to complete the level anyway. Be dazzled as a dozen teleporters are all simultaneously manipulated to keep enemies away from our hero. 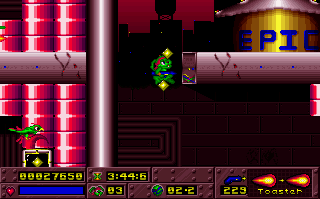 Be sure not to fall off your seat when you see Jetman passing through spikes unharmed or completing levels with just the right amount of fuel, and narrowly avoiding certain doom from becoming trapped in reappearing walls. Practically every aspect of the game was carefully analyzed and thoroughly documented by our users, slamo, Svimmer, Ilari, Nach, creaothceann, and hegyak for the creation of this run. This includes full level maps, with secrets in plain view. Since the action is so fast paced, there's an alternate YouTube encode at 43% speed, and alternate download encodes at 50% and 75% speeds. It is recommended to watch this run at a slower speed to fully appreciate the timing and many of the tricks performed. DOS Mystic Towers (unknown v1.1) in 10:16.06 by slamo. 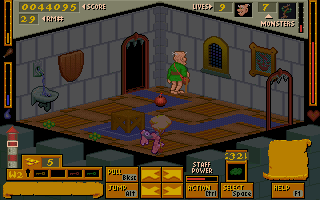 Developed by Australian company Animation F/X and published by Manaccom domestically and by Apogee Software internationally, Mystic Towers is an isometric action RPG released in 1994. You play as Baron Baldric, a geriatric wizard who must rid the twelve Lazarine Towers of all of their monsters to release his village from a curse. slamo lifts the village's curse in record time. 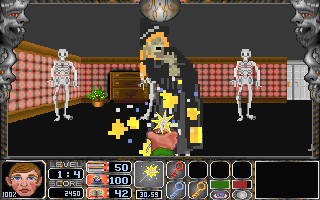 DOS Nitemare 3D (shareware 1.9) "Episode 1" in 06:18.33 by slamo. 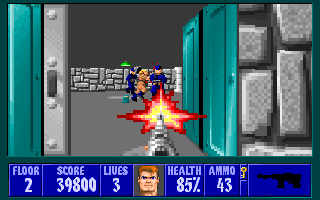 Released by Gray Design Assoicates in 1994, Nitemare 3D is a first person shooter in the same vein as Wolfenstein 3D. The game is a follow-up to the Hugo trilogy of parser-based adventure games and chronicles Hugo's fight to rescue his girlfriend Penelope from an evil scientist named Dr. Hammerstein. The first episode, played by slamo in record time, is a journey through Hammerstein's bizarrely designed mansion, featuring witches, vampires, and closets that seem to go on forever. DOS Wolfenstein 3D (1.4) "Episode 3" in 02:47.26 by slamo. 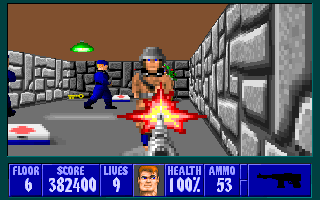 Wolfenstein 3D is a first-person shooter developed by id Software and published by Apogee Software in 1992. It follows the mission of a World War II Allied spy, William "B.J." Blazkowicz, to take down Hitler's Nazi regime. 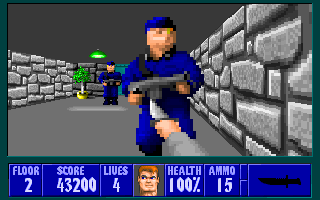 Also known as Wolf3D, it is widely regarded as having helped popularize the first-person shooter genre on PC and is id's precursor to the wildly popular Doom series. slamo, using various tricks, kills a modernised version of the Führer (and thus rewrites history) as fast as possible. An alternate encode with a map display provided by the author is available right here. DOS Wolfenstein 3D (1.4) "Episode 4" in 02:40.73 by slamo. slamo uncovers the dark secret and kills Otto in record time. 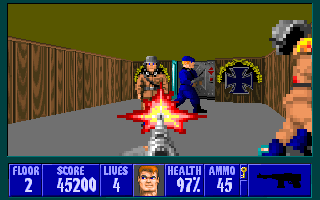 DOS Wolfenstein 3D (shareware 1.4) "Episode 1" in 02:41.42 by dwangoAC & slamo. 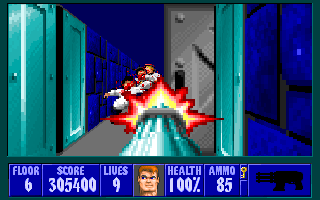 dwangoAC and slamo escape from Castle Wolfenstein as fast as possible, using various tricks. Read the authors' comments for more details. An alternate encode by the authors with the map display is available right here. DOS Wolfenstein 3D (1.4) "Episode 2" in 02:52.7 by slamo. slamo utilizes diagonal dashing and careful manipulation to get through Operation: Eisenfaust as fast as possible. DOS Wolfenstein 3D (1.4) "Episode 5" in 01:52.67 by slamo. slamo follows the trail of the madman and uses tricks to skip this episode's boss in order to beat it in record time. Please read the author's comments for more details. 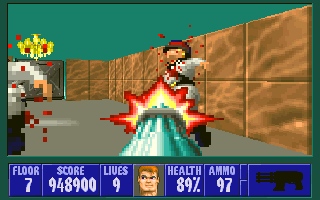 DOS Wolfenstein 3D (1.4) "Episode 6" in 03:45.93 by slamo. slamo survives the confrontation with General Fettgesicht and clears the record in record time. Please read the author's comments for more details. slamo's DOS Commander Keen 4 "paddle war" in 00:01.66 - An April Fool's submission, rejected for being easily reproducible by human input. I like my submission text though. Memory poker - Very simple memory writer. Mouse script - Simple mouse mover, a slight upgrade over the default interface. Wolf3D map script (registered) - Gives you a minimap and some other RNG info for Wolfenstein 3D. Only works for the registered version. 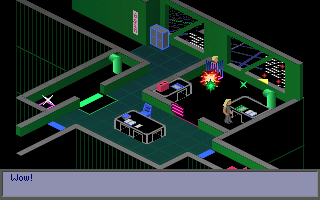 Wolf3D map script (shareware) - Map script for the shareware version. Wario Land II navigation script - Displays the properties of tiles on the screen, mostly used for out-of-bounds navigation and exit finding. Wario Land 3 navigation script - Like the Wario Land II one. This page appears to be the personal page of slamo.